Flocked Pig Figure (Orange) - This Little Piggy is SO CUTE! 5.25" Flocked Bunny Figure (Yellow) - SO CUTE! 9" Flocked Bunny Figure (Blue) - SO CUTE! 9" Flocked Bunny Figure (Yellow) - SO CUTE! Details about 9" Flocked Bunny Figure (Orange) - SO CUTE! 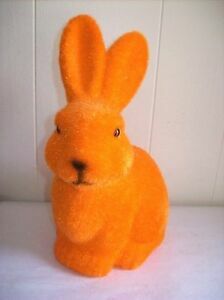 9" Flocked Bunny Figure (Orange) - SO CUTE!